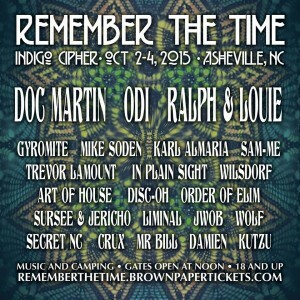 Remember The Time Electronic Music Festival will take place on the weekend of Oct. 2-4, 2015 in the stunning natural surroundings of Asheville, NC at Camp Driftwood beside the sparkling French Broad River. Djs for this event include house music legend Doc Martin and pioneer of the East Coast drum and bass scene DJ Odi of Konkrete Jungle. Southeast funky house veterans Trevor Lamont and Sam-Me, together known as Southern House Avengers, will be coming in from Tennessee as well. The Asheville techno and house music trio In Plain Sight are on the bill, along with several veteran djs of the NC rave scene like DJ Soden, Mr. Bill, Sursee and Jericho. Up and coming drum &bass producer-performer Liminal, a recent Asheville transplant from Myrtle Beach, will be there bringing plenty of exclusive tracks. Remember The Time Festival will be a camping event at Camp Driftwood located less than ten miles from downtown Asheville. This event that features of music, art, and camping will recall the spirit of the old school NC rave scene with a diverse lineup of electronic dance music genres blending together to form a unified vibe. Tickets for campsites which will accommodate up to 4 adults are $22o, which works out to only $55 per person. Get your tickets now from this link, Remember The Time Festival tickets. Follow Beyond EDM on Twitter for the latest EDM event news, or join us on the Beyond Events Facebook page. Our blog about EDM will keep you up to date on EDM events, EDM event tickets and news about your favorite techno music and house music performers.